This article was originally written for DZone. Why is this a big deal? How can a streaming framework be a game changer? The hatch lies in the fact that some data rapidly depreciates, and if it is not processed rapidly can become useless. Think about fraud detection or processing stock prices. Also unbounded sources of data are now very common and stream processing is a more natural choice. 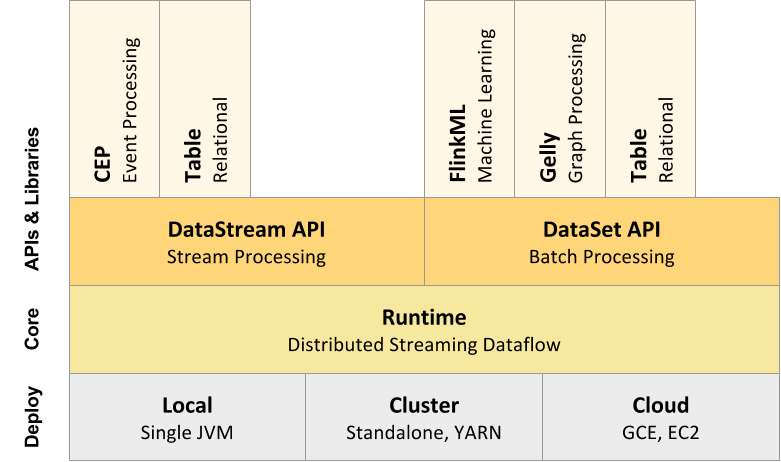 Batch and stream support – Flink allows you to use a single system for both batch and stream data processing. Batch processing looks very similar and the main difference from the developer’s perspective is that Flink provides different sets of operations for streaming/batching. Java/Scala/Python support – while Flink is mostly implemented in Java it allows you to write data processing application in Java, Scala, and Python. It also has integration with Apache Zeppelin, a web-based notebook for data analytics. Multiple execution environments – the Flink application can be executed in a distributed environment on YARN, Mesos, EC2, Google cloud or locally (for testing purposes). Various input/output extensions – the Flink framework has multiple connectors for reading data (called sources) and for writing result data (called sink). These include queuing systems (Kafka, Kinesis, RabbitMQ, etc. ), databases (HBase, JDBC, MongoDB, etc. ), filesystems (HDFS, S3), and even some exotic connectors like Twitter connector. Powerful libraries – the Flink team has implemented a number of libraries on top of stream and batch processing which include graph processing (Gelly), complex events processing (CEP), and Machine Learning library (ML). SQL support – another library built on top of Flink that allows you to implement stream/batch processing by writing SQL queries. Exactly-once processing – Flink provides exactly-once processing guarantees that allow accurate stateful computations on streams. Fault-tolerance – Flink implements a lightweight checkpointing mechanism that allows to accurately process data even in a case of hardware failure. Flow control – if you have a slow step in your processing pipeline Flink will naturally cause a backpressure on previous steps and data source causing them to produce new elements slower. Vibrant community – in recent years, Flink developers have built a significant community around the project. Big companies like Alibaba and Zalando have started using it for Big Data processing, while a number of Open Source contributors has tripled since last year. True streaming – Spark started as a batch processing framework and implements streaming on top of it as a series of micro-batches. In turn, Flink implements real-time streaming, meaning that individual elements are sent forward as soon as they are processed by current “pipeline” step. This allows achieving lower latency and more efficient flow control. Memory management – Flink is working on top of a JVM and can be susceptible to common memory issues, such as long GC pauses. To avoid this, Flink implements custom memory management separate from the JVM memory management system which allows to significantly decrease GC overhead. Event-time processing – when a streaming system is processing an incoming event, it can consider either its originating time (called event time) or current system time (called processing time). Because some events can be delayed (e.g. because of network issues), event-time processing requires processing elements in a different order. Flink has support for event time processing and can process out of order and late events. Savepoints – Flink allows you to stop your cluster, update the code you are running and start it again all without losing data. Now we can count how many times each hashtag was encountered during a five-minute period. This is pretty straightforward. At first, we need to define a key in our stream using the keyBy function. It is somewhat similar to “group by” functions and means that the following operations will be performed on individual groups of data. The only parameter to the keyBy function specifies what field in each input element should be used as a key. In this case, we pass 0 since the first element of each tuple is a name of a hashtag. out – a collector instance similar to one in the flatMap function that we can use to generate output elements. We will use it to produce one element per window (top tweet), but it can be handy to produce multiple elements, e.g. if we need to find top N elements.